Just a few weeks ago, I was fortunate enough to make a quick trip across the pond to pick skis at the Amer Sports ski factory. Salomon and Atomic both fall under the Amer Sports umbrella and their race skis are manufactured in Altenmarkt, Austria. Since flights into Salzburg were super expensive, we flew into Munich, Germany. When I say we, I am referring to my good friend Josh Doebbert. 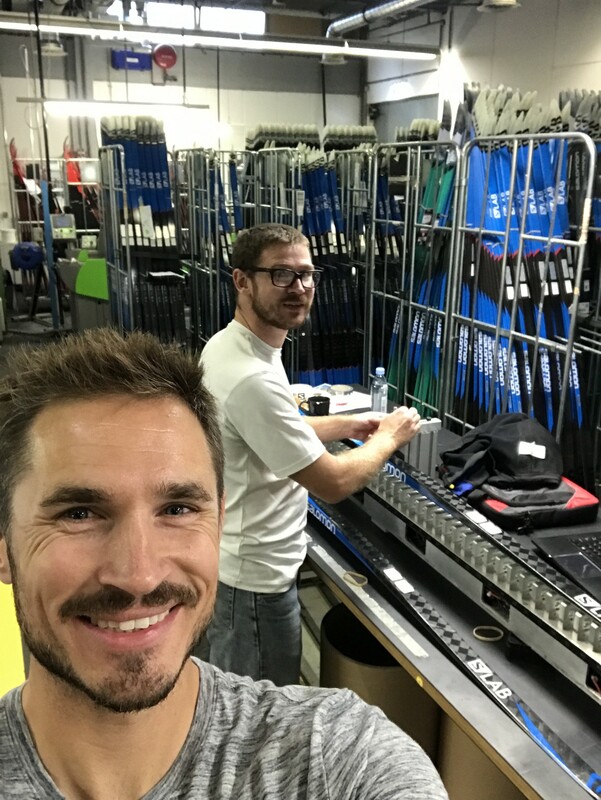 Josh is one of the engineers on my technical team that helped me build a new ski flex tester and he is very experienced at working quickly and efficiently when picking through thousands of skis. We decided during the design phase of this tester to make the total weight including custom case, less than 50lbs. This would allow us to easily travel with our flex tester on airlines. Picking skis by hands and eyes is great but having a tool to quantify your hands and eyes after hours of ski picking is very useful. Additionally, using pressure instead of pocket length measurements (pretty much everyone uses pocket length to try to quantify skis) is arguably a better measure of ski performance; more on this in a future article. Josh and I drove from Germany to Austria on the autobahn and I loved it. Josh was a little worried with the no speed limit thing and me driving but we made it no problem. We met Jean-Marc Draeyer and Martin Rohrmoser bright and early on Monday morning (11pm CST) to start our 12hour picking day. Jean-Marc and Martin are in charge of the “kilo” programs for Salomon and Atomic. Skis in the Kilo area are the cream-of-the-production-crop. These skis are the most closely paired and exhibit the quantities that Jean-Marc and Martin deem desirable… a farmer knows where his best crops come from. This does not mean that production skis are not good. 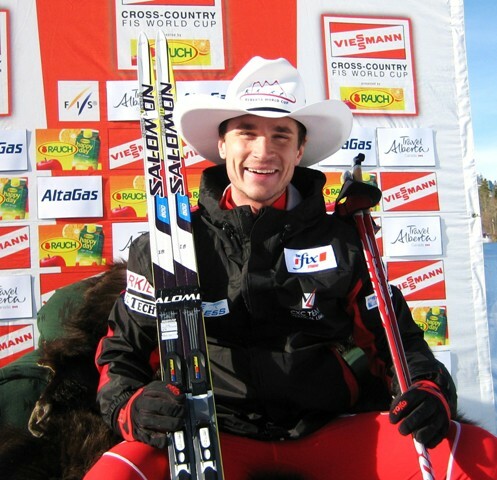 In 2010, I went top 30 on the World Cup in Canmore on a pair of “normal” production Salomon skis in arguably one of my best race results of my career. Everyone reacted with “wow” you must have been on a super day. Well the truth is, I was having a mediocre day with my body (I had a limited acclimation period), but my skis were absolutely incredible in the cold Canmore snow. (Salomon makes some of the best cold snow skis and now wet snow skis in the world… more on that later). Once we had some espresso with Jean-Marc and Martin, we went about unpacking the flex tester and discussing goals for the day. The Amer guys were pretty intrigued with the tester and we burned some time showing-and-telling with over a dozen Amer sports employees. We showed them our process and then Jean-Marc showed us how the kilo skis are chosen, paired and measured. 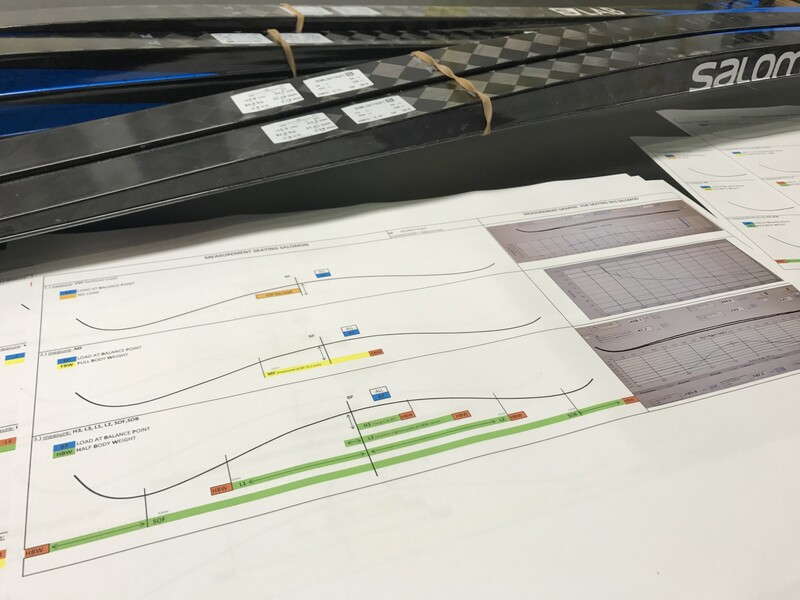 It is a pretty intensive process and involves a lot of measurements and numbers. Being an engineer, I like this approach a lot vs. the squeeze and tell method of picking (not to say a highly trained set of hands and eyes cannot pick world class skis, I picked my 2010 WorldCupTop30 ski with my hands and eyes) After we settled in, Josh and I spent hours going through racks and racks and racks of Salomon and then Atomic skis. We were picking skis for both specific customers and general inventory for the shop. Josh and I would start sorting kilo skis of a certain model and length with our hands and eyes, picking the best we could find… which were pretty darn good. Then we would flex test our hand chosen pairs and take only the top percent of those skis. Essentially, we were taking the cream (kilo skis) of the cream (hands/eyes) of the cream (flex tester)… that’s the best cream. After more than 12 hours of ski picking, we had a very robust and high quality rack of skis to bring home. One additional benefit of the trip was some time spent with the stone grinding techs from both Atomic and Salomon. I was super excited to see they were operating a pair Wintersteiger machines: same as I use at the shop. The Atomic techs were a little close to the vest when I was inquiring about some of their most successful Amer Sports World Cup grinds… AC, AM7 and AW7 but afterhours, the Salomon tech turned on the machines and went though menus, settings and everything with me. I was pumped to discuss their grind theories and methods, and found they fall in line with everything I know and utilize. Also, Josh and I did get a chance to flex test and discuss some prototype molds/skis during a brief session with Martin and some of the development team. Later, I peeked (rummaged around) in their actual race ski development room and was excited to see different core materials, base material and even skis from other brands. These guys are serious about development and I am excited about the direction for Salomon and Atomic. Who can look at what Jessie Diggins and Alex Harvey are doing with these skis on the World Cup and not get excited?! S/Lab Carbon Skate Blue (Cold): This is the new ski in the Salomon line-up and the one I had the most inquiries about during our preseason. I first heard about this ski a few summers ago when I was training on the Haig glacier INSERT with Scott Perras. Scott is a 2014 Olympic biathlete and sponsored by Salomon. Sometimes the World Cup biathletes get the new cool stuff before the regular World Cup athletes (Biathlon is a big deal in central Europe). Scott shared a tech and skis with fellow athlete Brendon Green. Both of those guys were having great success with the prototype blue carbon skis in both soft cold and firm cold snow. The camber height is lower on these skis vs the old carbon skis and the glide zones were long and amazingly smooth. We had great success finding a ton of great cold skis in the Carbon Blue. 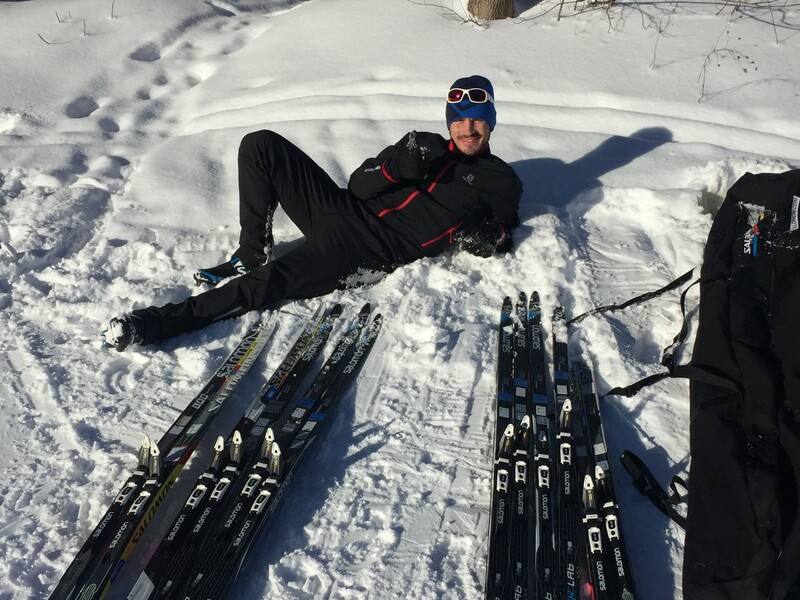 Also, I picked more than a few pairs with enough universal camber properties that they could handle cold snow warming to glaze… think perfect Birkie conditions: below zero/single digits over-night warming to teens/twenties in beautiful sunshine by race finish. S/Lab Carbon Skate Yellow (Universal): This is the Carbon Skate Lab from last year. In Salomon lingo, blue is cold and yellow is universal. A few years ago I didn’t win the argument with a bunch of Salomon people that green is cold, universal is blue/violet/red and wet/warm is yellow but again, I am an engineer and not a marketing person. This year’s Yellow/Uni skis are looking great. They are more refined compared to last year’s production. Last year I saw some camber confusion and skis with the bridge too far forward and aggressive front end pressure along with tail pressure that did not match well within pairs. This year all of that seems much tighter and more controlled. Bridge position was appropriate for a universal ski and I was able to find carbon yellow skis that leaned both to the warmer and to the colder side of things. Also, the base material on these skis can take wax very well to be hard enough for green conditions. Disclaimer: I am a Salomon sponsored and my bag is full of Yellow Carbon Lab skate skis that each work in a vast array of conditions. Two years ago I was 2nd place by 5 seconds to my training partner and best friend, Brian Gregg, on a pair of now Yellow Carbon skis with race temps of 0F at the season opening SuperTour at West Yellowstone. Additional, Salomon is now offering this ski in 177cm length and some of my shorter/lighter customers are super excited about that! S/Lab Carbon Skate Red (Wet and Artificial): “I’m all bout that bass, bout that bass, no treble…” Oh wait, that’s bass and I mean base. Red base, clear base, grey base… whatever you have heard it referred to as… it all is the same Amer sports wet/warm/humid base material. This is very likely the most universal wet snow base material in the industry. A few years ago on that same Haig glacier trip that I had the great pleasure of crossing paths with Scott Perras, I had in my bag an early production pair of Carbon Skate Red skis. Scott filled me with jealously as he talked about his Carbon Blue prototype skis but I had the Carbon Red skis with me. It was by far the fastest ski in wet snow once things started melting down around 10:30 each morning. I let Scott “demo” that pair for a few laps and I didn’t get it back from him until days later. Salomon has had some unbelievable days on the World Cup with their Red base skis. Jessie Diggins, Matti Heikkinen, Maurice Manificat, Alex Harvey have all had days when they have had a distinct advantage with these skis. I am specifically thinking about the 2016 Tour de Canada during the Canmore stages in the 50F+ weather when Heikkinen won the 15km skate, 2nd in the pursuit time of day and 3rd in the 30km skiathlon. His skis were ridiculously fast compared to Sundby and Ustiugov. Matti is a super fit guy but I know skis made a huge difference those days. The one caution with these Red skis is that they need to have a camber profile that matches the conditions. In last years Red skis and some of this years Red skis the camber profile did not match the wet/warm profile. That is OK sometimes because the Red base can be unbelievably fast in frozen corn or artificial snow all the way down to 0F. But if you want the best universal wet snow ski your money can buy, I would make sure you have someone knowledgeable pick these Red skis for you. 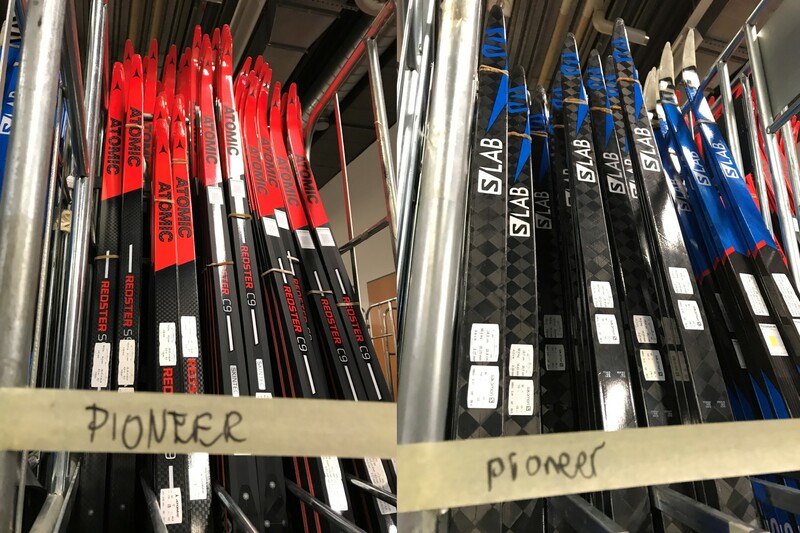 At Pioneer, we have had too much experience with man-made snow and wetness over the last few years and we are very familiar with picking and preparing these skis. Wax-wise, I could write many more pages about Red bases and preparation. If you are thinking about racing World Masters this year at Wirth Park, a Salomon Red base ski might not be a bad idea to have in the bag. S/Lab Classic Blue (Cold): I tried this ski for the first time in November of 2015. Isaac Wilson, Nordic Commercial Manager and good friend, took me aside and showed me two pairs of the newly re-designed Salomon classic race skis. He said I could ski on them for a few minutes and then would need them back as the official release was not happening until later that winter. I grabbed the best feeling pair of the two after a quick squeeze and skied off. FINALLY is what I thought to myself. Salomon has finally designed and built a classic ski that could compete with the other brands on the World Cup level. I was previously sponsored by Salomon/CXC from 2005-2011. During that timeframe, it was very difficult to find good or robust classic skis from Salomon. With the new design from Salomon, finding great classic skis is much easier. That pair I tried from Isaac is still in my bag (he never got it back) and I had my best nationals’ classic result on that pair in 2016 in cold snow at Houghton. The Blue classic ski has less splay and a very low riding pocket. I have used it with marginal results when going to warmer kick waxes (think Start Oslo) and very limited success in the klister range but for a green and blue and maybe violet hardwax ski… amazing. S/Lab Classic Yellow (Universal): The yellow classic skis from Salomon looked great this year in the kilo department. The production look very excellent and consistent and I was able to find many skis with camber shapes that would allow the use of hardwax and klister. I was able to grab a pair of yellow classic skis for myself last summer and this was my go-to pair of klister covered and warmer kickwax conditions skis. I won the City of Lakes Loppet classic race on this pair and I had amazing kick even with going extremely thin and even with my wax crew of Andy Brown and Tom Carlson dumping liquid fluoros all over my kick zone. INSERT If you are looking for a do everything classic ski, look no further. S/Lab Classic Red (Warm): See my notes above about the Red base. This is a klister ski and it does it very well. I spent almost all of my Haig glacier classic time on this ski. The camber is high and carries klister very well and the flexibility of Salomon’s core allows for easy kicking. Selection is important as I noticed some production skis had camber confusion… the profile did not match up to the base material. Also, some pairs had a bit too much fight in front of the pocket for my liking. But the good pairs we selected were really really excellent and I am going to make some happy customers with these skis. S/Race Skin: This ski has won over Jessie Diggins and if it is good enough for Jessie it’s good enough for us. 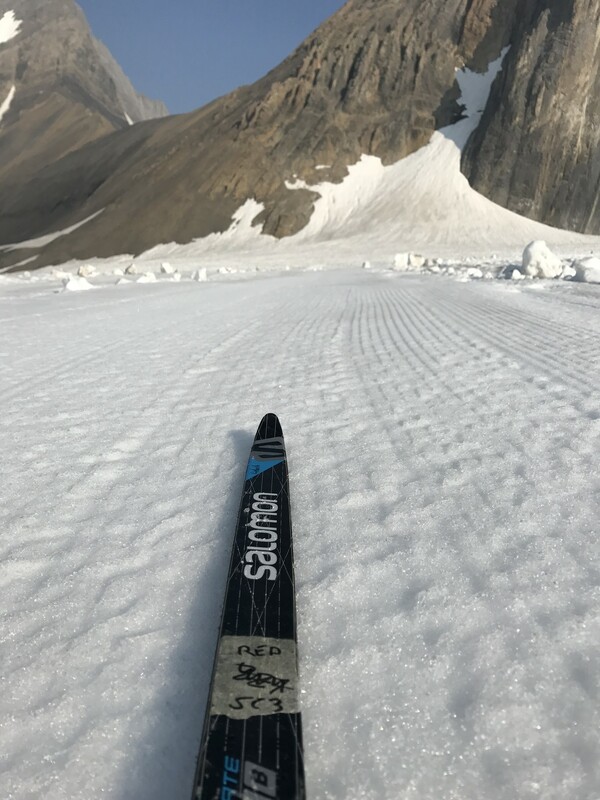 I was able to test 3 pairs of these on the Haig glacier this summer and while I preferred my S/Lab Classic Red skis with a beautiful klister mix… these were just easy: no prep time at all. I am a firm believe that classic skiing and learning to classic ski will make you a better skate skier. A large percentage of my customers only skate ski and if they classic skied a few times a week; it would help their balance and let those skate muscles recover a bit. 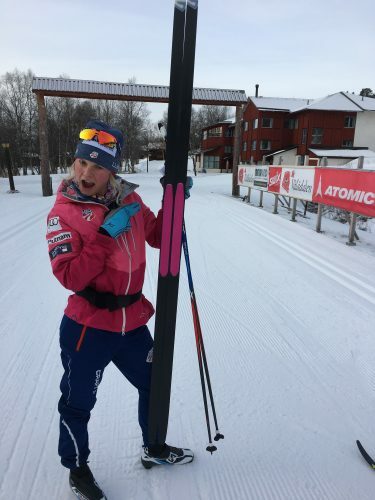 Another interesting development in skin skis is that now over ¼ of the Norwegian Birkie skiers are using skins for the race. There is a huge development in skin ski technology and the argument has been made that skin skis are saving the sport especially the traditional classic technique by avoiding the hurdle of kick waxing. 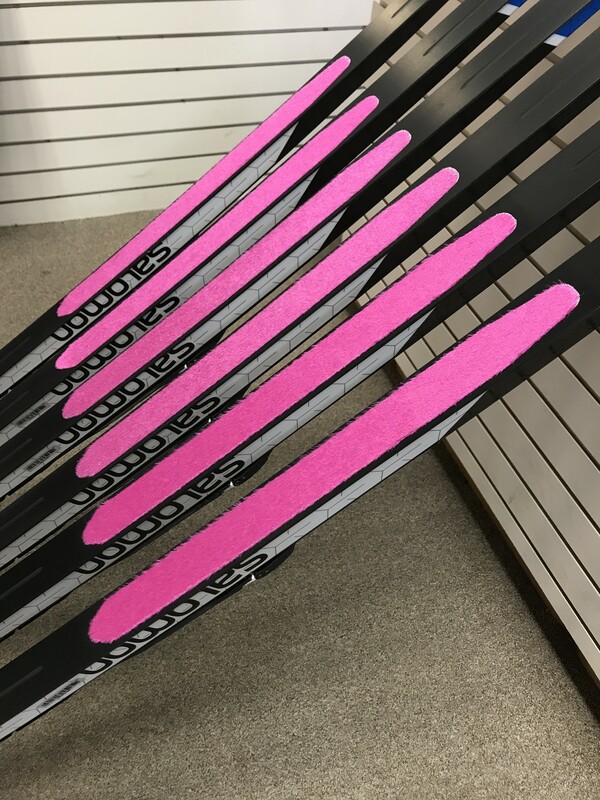 We have skin skis at all price points, the S/Race is the version you want if you plan to ever race on a skin ski or potentially race on a skin ski if the waxing becomes a nightmare scenario… or if you just like a great performing ski. Redster S9 Carbon (Universal): This is a new ski from Atomic and we had the chance to ski on it last year. It created a lot of excitement for us as the ski was really fast but had a bit more stability than I would have expected. This stability was affirmed when I was picking and flex testing the skis because the bridge was located a bit more underfoot and the camber was more balanced. Josh Doebbert was so excited during our picking process, he is planning on snagging a pair for himself. Redster C9 Skintec (Skin Ski): Our most anticipated new skin for this year. Atomic started the skin ski revolution and now they are bringing the skin technology to market in a race level ski. This has been a long time coming and Adam was able to ski on a pair of these last year. So far, this is the only skin we have been on that performs on the same level as the Nanosonic skin from last year. The pocket is slightly recessed and tapered which really helps improve speed without sacrificing any skin-like kick.